25th-27th May. MCM EXPO, ExCel Exhibition Centre, 1 Western Gateway, London, E16 1XL. I'll be guesting on The Victorian Steampunk exhibition on Saturday (all day) and Sunday (until around 3pm) with David J Howe. We will have books and other goodies for sale during this time. Also attending on Saturday afternoon is Stephen James Walker. Copies of his latest book 'Cracks in Time' will be available. I've been told that there are around 62,000 people attending this event. Plus MCM Expo have just announced that DAVID GIUNTOLI the main lead in GRIMM will be there. So fans of the show may want to attend this year. We arrived in Colorado on Tuesday 21st February after travelling for approximately 24 hours. Yes! It was a very long trip. David and Diann Wacks met David, Frazer and I at the airport with a lovely young lady called Stacey Vowell. With all our luggage they rightly guessed that we would need two cars. I can't say I remember the journey to the hotel at all, by then we were all pretty out of it. Poor David was so exhausted he barely said a word all the way there. In my case though I became completely hyper and talked Diann and David Wacks to death for the 30 minute journey. Once at the hotel we discovered that the convention had booked us into a double suite. Frazer had his own bedroom and bathroom on one side and we had a bedroom and bathroom on the other side. Between us was a huge lounge/dinning area with a kitchen and yet another small bathroom. We were utterly spoilt. David went straight to bed and Frazer and I went over the corridor to GalaxyFest Central - where we soon learnt that the heart and organisation of the con was taking place night and day. Frazer and I had a glass of wine and a donut (dunked in Kraken rum). It was probably about 9pm local time when the jet lag really bit and we both went off to our rooms. We were aware by then that the altitude really did effect our ability to consume much alcohol. One drink, and I was certain to sleep well that night. 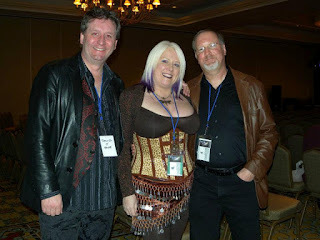 The next day we met up with Karyn Valentine, who has been one of my facebook friends for years. Karyn kindly took us sightseeing. We got our first look at the Rockies and Pike's Peak (from a distance), drove through and took photos of the Garden of the Gods, and ended up in Manitou Springs. I later learnt that Manitou has a unique history and this is going to appear in one of the stories I'm been asked to write recently - more on that to follow. We ended the day with ice cream. I had Pumpkin Pie flavour and it was very strange but also very nice. All of us really liked Manitou and would probably like to spend more time there. Colorado Springs is a mile above sea level and so this can have an effect on you until you adjust to the environment. David suffered nose bleeds every morning and I did have problems with my breathing - fortunately I had my asthma inhaler and that did help a lot. By about 5pm we were feeling the effects of the jet lag and altitude quite substantially. Karyn took us back to our hotel and said goodbye. We chose to have a very light supper and then all went to bed. On Thursday David Wacks had arranged for a signing for us and some other authors at a local bookstore. It was really fun to meet some of the others in this intimate venue and we sold a few books to some lovely people who turned up to meet us. It was nice to meet up with Christopher M Salas, Gary A Wilson, David J Corwell and Samantha Shu. 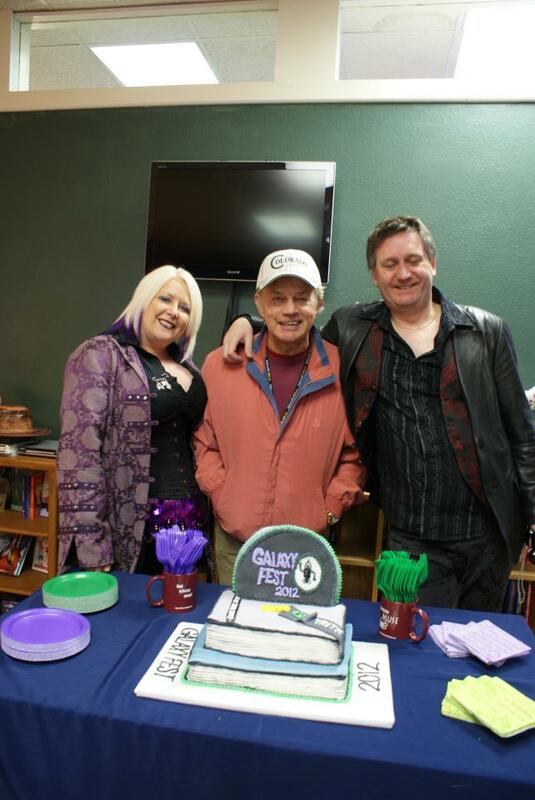 David Wacks also surprised us all with a gorgeous cake. I felt pretty honoured to have Killing Kiss named icing covered spine alongside Kevin J Anderson's Veiled Alliances. It was super to see Karyn Valentine again and meet her husband Steve and to hook up with Russell Lott too. That evening we went out with Karyn for dinner to a lovely restaurant she recommended called Mackenzies and had a great steak dinner - which I couldn't finish partly because of the huge portion sizes and partly because my appetite had shrunk down since we arrived. On Friday the convention started and so we were seriously to work for the first time. We were allowed in the dealer's room around 10am to set up our tables and then went off to relax for a few hours. The event officially started at 3pm when the dealer's room would be open. Outside in the lobby there were huge queues forming for people to register and the hotel was buzzing with anticipation and excitement which was emanating from the attendees. The dealer's room was huge, filled with booksellers, steampunk stalls, artists and of course the main guests which included Kevin J Anderson, Dean Haglund, Denise Crosby, Chase Masterson, Angus Oblong, as well as David Howe, Frazer Hines and me. I noticed that outside there were many tables lining the hallways which were rapidly filled with a variety of dealers also. David Howe, Frazer and I were the first panel - the Brit Invasion. This started at 4pm and was moderated by David Boop, Toast master of the event, who interviewed us all together and individually on stage for an hour. It was great fun. Immediately following this event was opening ceremonies and while we waited for this to start I went to the back of the room only to bump into Kevin J Anderson. I recognised Kevin immediately as we are facebook friends and I follow him on Twitter as well. Nothing could have prepared me for the warm welcome I received from him. He said 'Oh my God. Sam Stone. You're just as gorgeous as your photos'. Then he hugged me and I felt an immediate warmth and friendship for him. I never expected him to recognise me and so that welcome was a highlight for the convention for me. He is a truly lovely person. Opening Ceremonies went off without a hitch. We were all called on stage to say hello and it was really fun to see all of the other guests together. David Boop and James Nimark did the introductions and in James' case gave advice to attendees about personal hygiene (which was not only inspirational but was hilarious as well). After that Kevin invited David, Frazer and I out to dinner with him and his lovely wife Rebecca Moesta. He took us to a local pub which was literally in walking distance of the hotel and had great food. It was super to spend the evening with Kevin and Rebecca and actually start to get to know them. After dinner we had a con commitment to go to a private party that attendees had paid for so that they could get an opportunity to meet up with the guests and chat to them informally. This is where I first got to speak to Denise Crosby. Denise and I spent the evening putting the world to rights and drinking wine, (I definitely had too much of the latter). I'm a huge Trekkie fan, having watched Next Generation for years. The icing on the cake was to learn that she is so down to earth and incredibly easy to talk to. By about 11pm though, David and I were feeling the effects of the day again and we went off to bed leaving the party in full swing. Saturday and the first full day of the con. This was a day of panels and spending the time in the dealer's room. One panel was on 'Niche Writing' with Rebecca Moesta, Betsy Dornbusch and some welcome gate-crashers - Mario Acevedo, Jeanne Adams. It was well attended and much fun. It was interesting to hear the views of American authors and their take on niche writing. That evening Kevin and Rebecca took us to their local pizzeria - which was awesome. Then we returned to attend the guest mixer party for that evening only to learn everyone had disappeared to go to the Kilt Blowing event (I heard it was very, very funny). Sunday seemed to come around so quickly. It was the last day on the con and we had more panels, another Brit Invasion interview and Closing Ceremonies to attend. 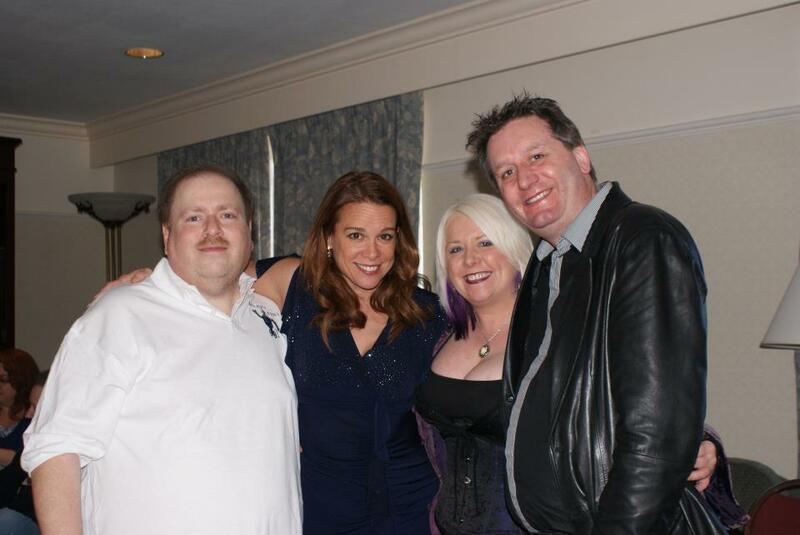 I spent the time in the dealer's room chatting to Dean Haglund whenever we were free, and Denise and occasionally the lovely Chase Masterson. For closing ceremonies Chase performed a terrific riff of 'Diamonds are a Girl's Best Friend' but with substituted words that were Babylon Five specific. She was awesome. Stunning voice, great performance and she deserved the standing ovation we all gave her at the end. That evening Kevin, Rebecca, Dean, Frazer, David and I went back to the pub for dinner. It was less busy and the food was once again terrific. When we got back to the hotel we said our goodbyes to Kevin and Rebecca and they were going home then. I hugged them. A lot. And I was missing them when they went. What a terrific couple. On Monday, the con was sadly over but we still had one more day in Colorado Springs and so Stacey Vowell and Christopher M Salas took Frazer, Chase, David and I all western riding at The Stables which was in the Garden of the Gods. I've ridden a lit in the past and wasn't too worried, but the stables were very safety conscious and so we all had a horse suitable for our level of ability. My horse was called Bonita and she was really tall. It must have been hilarious watching me trying to mount her because I did struggle to get my leg over! The weather was glorious that day and so the trip through the Garden of the Gods was pretty special and fun. Afterwards we went out for a very small snack and a drink on the way back. Then David and Diann Wacks took us all out for dinner at the best restaurant in the area - The Famous. Afterwards we all went on to a local club where Dean Haglund was set to do his X-Files improv show. It was EXCELLENT. We were all laughing so hard that our sides were hurting and Stacey and Diann couldn't breath! So Dean - you nearly killed us all with laughter. You rock! Tuesday morning and it was time to say goodbye and I have to admit this was a little tearful. I am incredibly grateful to Diann and David Wacks, Stacey Vowell and Christopher Salas for taking such good care of us all weekend. Thanks guys. It was totally awesome and I feel like I have several new and wonderful friends in Colorado Springs and other parts of the USA now thanks to you. Well that was the end of our adventure to the Rockies. We've been invited back next year and - I hope we get the opportunity to make it again!